So you want to study in Spain, do you? Well, tío, let’s take this one step at a time. Before you can be jovially joking with locals over a Mahou and chatting about Mourinho’s big move, you’re going to have to learn at least a few camouflage techniques before your North Face, Yankees hat and flip flops get you written off entirely. On par with English, Castellano is riddled with twists, turns, idioms and and a caña-load of colloquialisms. While meager in length, this list aims to bridge the gap many Americans struggle with upon first arriving in Spain. It is hardly meant to be an end-all be-all, rather to give an elementary rundown on many of the most common phrases of the calle. There are clearly thousands of other phrases and idioms that really are a hoot and a half (see tabla de chocolate), but those are all the more interesting and appreciated when you learn them –sometimes accidentally – on your own. Also, I realize these will seem comically obvious to some folks, especially to those with prior experience/exposure to peninsular Spanish. However, for those who don’t know vosotros from velociraptors, and have previously indulged in a much heavier diet of Latin American-focused Spanish such as myself, hopefully this index will help shine some light as to just what the heck all those mayores in the pub are yammering about. 1.) GUIRI – Most likely, YOU! 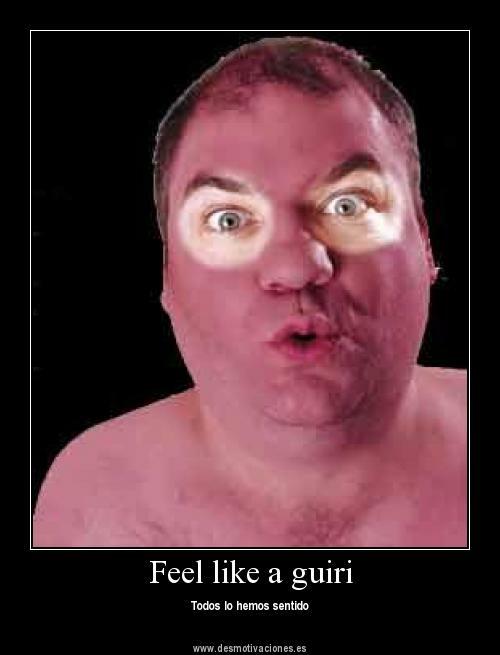 A guiri is to Peninsular Castellano what a gringo is to Latin American Spanish. The word itself is not necessarily offensive or a cause for alarm, but if heard, it’s probably a sign that you’re not exactly blending in. It’s often accompanied with an eye-roll and something along the lines of, “look at all the guiris at McDonald’s today, madre mia.” Also, a quick google image search will tell you all that you need to know – albeit with a bit more socks and sandals than actually exist in real life. 2.) VALE – A friend told me that the very first thing his program director from southern Spain told him was, “the first and most important thing you need to know about Spain is vale.” From a linguistics standpoint, truer words have never been spoken. The uses and meaning of the word are expansive to say the least, and it is often one of the first true colloquialisms Americans seem to pick-up on and use. Essentially, it can be boiled down to mean: ok, alright, understood, sounds good and just about any other affirmation to a question your mind can conjure up. It is also an odd animal in that it can be used as a question of verification, with the proper response being the exact same word: “Vale? Vale.” Basically just to ensure that the listener is picking up what the speaker is throwing down. 3.) TÍO/TÍA – You got it Dude! Sorry, but Michelle Tanner would have so been all over this if she happened to be born in Madrid instead of San Francisco. This slice of slang, known academically to mean “uncle” or “aunt,” behaves as what in English would be: dude, man, bro…fill in the blank with fratty term of endearment. The somewhat refreshing spin is that it is used by and to describe females just as much as it is males. Don’t know about you, but I think the last time I heard a girl seriously use “dudette” to refer to a gal pal was, well, never. 4.) EN PLAN/O SEA – As far as direct translations go, en plan functions similarly to “like” in English and o sea acts as something along the lines of “I mean…” Essentially, both of these phrases are used in the place of a comma in the vast majority of spoken Spanish interactions. If you are able to get these down and use them freely while abroad, a tip of the cap to you, as it is something that has constantly plagued my Spanish vocabulary – or lack thereof. These fillers will do nothing but help you get your chameleon on when speaking with locals and, in fact, probably make you seem more fluent than you actually are. Phrases such as these are always the trickiest to work into daily speech in any second language – so start practicing now! 5.) VENGA – This is a crafty sliver of sentence meat, simply because the definitions run from here to timbuktu. If you take the word for it’s textbook definition(s) it is the formal usted command or the first and third person subjunctive, but man-oh-manischewitz does it mean more. Used mostly as an interjection, it is often paired with other words to form phrases such as, “venga ya!” or “venga hombre!” which in English roughly translate to, “no way!” “Come on!” or “Yeah right/get outta here!” Although, perhaps the most common usage of venga is a goodbye at the end of a conversation – you’ll really be cookin’ with gas if you can casually drop that in at the end of your first phone conversation with a Spaniard. Here’s a word reference page with a bunch of the various meanings. 6.) JOLÍN/JOLINES –I had it explained to me that this is the word you (have to) use when you stub your toe in front of your grandmother – while your brain may be rattling off phrases that would make Lil’ Wayne look like Papa Francisco, you need to filter yourself to save your dome from a slap upside the head courtesy of abuelita. In English it can be related to replacing “shoot!” for another, similar four-letter word. And no, not spit. *I’m tempted to mention yet another fascinating verbal pillar of the Spanish language here, but still don’t know how kosher that would be even after living in the motherland for 10 months. I’ve heard 80-year-olds and I’ve heard 8-year-olds casually fling it into convos, but just for the sake of keeping things semi-PG, I’ll leave the extracurricular reading up to you. 7.) ¿QUÉ TAL? – An absolute staple of Spanish communication. If vale was the potato in a tortilla, qué tal would have to be the egg. Exactly like the aforementioned ingredients, both are ubiquitous, often go hand in hand, and are so unbelievably, quintessentially Spanish. How you greet someone every single time you see them, whether it be on the street, at a party, or walking into church, qué tal is the turkey to the linguistic Thanksgiving dinner, the Hall to the verbal Oates, an auditory handshake – well, you get the idea. Oh, and if you’re like me and were taught it means “what’s up,” don’t be made to look like the gillipollas I was and respond nada. ¿Qué tal? basically means, “how are you?” or if talking about a specific thing or event, (usually in the past) “how did X, Y or Z go?” So how do you respond? 95% of the time people respond with bien, regardless of how they are actually doing. Like in English, who ever wants to admit to having a crappy day? 8.) ‘STA LOOGO – Say bye-bye to adiós, and hola to this daily, linguistic necessity. Short for hasta luego or “see you later” in English, this is the phrase you will hear from shop owners, roommates, host parents, professors – you name it – as you exit any situation. Although, don’t take it too literally. Just because someone says “see ya later” doesn’t necessarily mean they have any intention of seeing you again, rather a polite way to keep the possibility open. And don’t ask me why, but many folks are keen on saying it in the deepest, most guttural voice that a human being can muster. So, if you can get the shortened, bastardized version down and say it while simultaneously trying to swallow your own voice box, people will be mistaking you for un@ español/a lickety split. 9.) 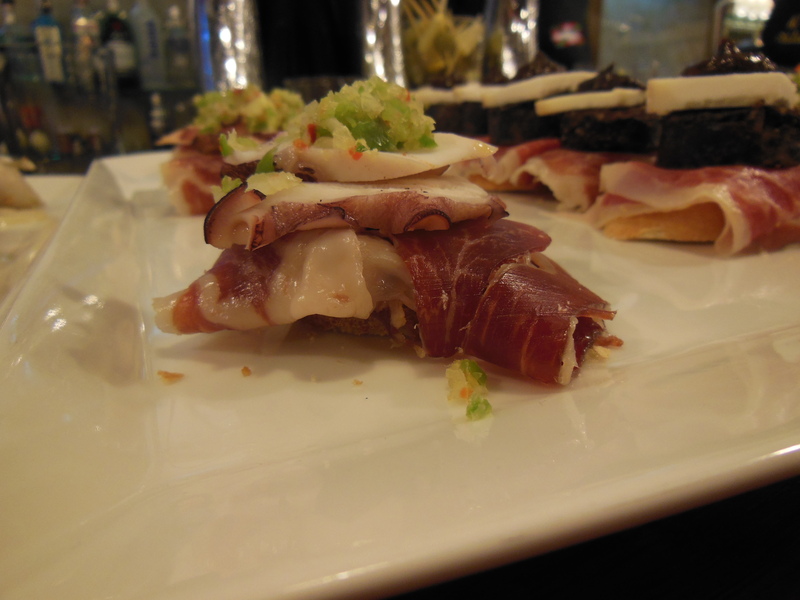 PINCHO/PINTXO – Yeah, yeah every schmuck and their hermano know about tapas by now, as just about every major American city has a slew of token tapas establishments. But, before ordering enough patatas bravas to clog up your arteries well and good, know that you might get straight up cold shouldered if you mention tapas anywhere north of Madrid. Originating from the Basque Country, pinchos are the equivalent of what would be referred to as a tapa in the south, though they are bigger and come at a fee unlike their complimentary, southern cousins. It all depends on where you go, where the chef is from and if they want to give you a hard time, but at the risk of sounding like a goober, just be aware there is a difference between the two. 10.) NO PASA NADA – If England has “God save the Queen,” Spain has “no pasa nada.” This phrase sums up the general attitude of many a Spaniard, and it is nothing short of fantastic. Late for class? No pasa nada. Break a glass in the kitchen? No pasa nada. Exams? No pasa nada. This often becomes the gospel for study abroaders in Spain as they slowly become entwined (and rightfully so) in the wonderful whimsy of wanderlust. -Pasta – NOT Barilla. Often used to refer to dolla dolla bills. -Majo/maja – Adjective used to describe a genuinely nice, goodhearted person (or just good-looking). -Guay/chulo – Synonyms: Cool, awesome, neat-o. -Resaca – Undertow, er, I mean, you can figure it out. Well there you have it. This list is meager to say the least, but hopefully it will help break some of the ice and make you stick out more like a sore pinky or ring finger as opposed to thumb. Also, if this was too PG for your liking or you just have natural pirate-like tendencies, go to your local urban outfitters and get this – but remember just because it’s in Spanish, doesn’t mean you’re not a potty mouth. Next Introducing our 2013 DUSA Student Bloggers! contribute to the conversation. It’s triggered by the fire communicated in the article I browsed. post a comment 🙂 If you are writing on other social sites, I would like to follow everything new you have to post. Sure! You can find our Facebook page “University of Denver Study Abroad Programs” or our Twitter handle @DUAbroad. Glad you enjoy it so much. Absolutely! Thanks so much for your interest!